A majority of Americans find little or no common ground with Donald Trump on issues, but the share who say they agree with him on many or all issues has risen since last August. The public’s assessment of Trump’s conduct as president is little changed over the past nine months, with 54% saying they don’t like the way he conducts himself as president. Currently, 41% of the public agrees with Trump on “all or nearly all” or many of the issues facing the country, while 57% agree with him on just a few issues or virtually none. In August, just 33% said they agreed with Trump on many or all issues. The latest national survey by Pew Research Center, conducted April 25-May 1 among 1,503 adults, finds that 80% of Republicans and Republican-leaning independents now say they agree with Trump on many or all issues, up from 69% in August. And while just 12% of Democrats and Democratic leaners say the same today, the share of Democrats who say there are “no or almost no” issues where they align with Trump has dropped from 77% to 58%. 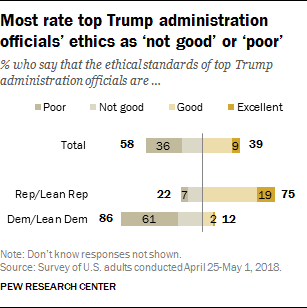 The Trump administration also gets low marks from the public for its ethical standards: 39% say the administration’s ethical standards are excellent or good, while 58% rate them as not good or poor. On these views partisans are deeply divided, with three-quarters of Republicans (75%) giving the administration high marks and 86% of Democrats rating its ethical standards negatively. 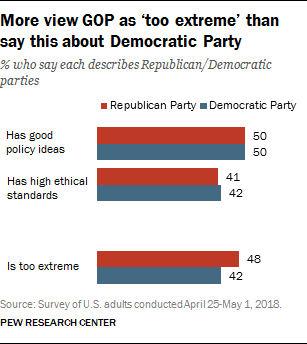 Critiques about ethical standards also extend to the two parties: Just 41% of Americans say the GOP has high ethical standards, while a nearly identical share (42%) say this about the Democratic Party. The Republican and Democratic parties are now seen by half of the public (50% each) as having good policy ideas, a trait the public rated Democrats higher on in 2017. And more continue to view the GOP as “too extreme” (48%) than say this of the Democratic Party (42%). Public confidence in Trump on most key issues remains mixed, though a narrow majority (54%) now say they are either very or somewhat confident in him to negotiate favorable trade agreements with other countries. This is the first measure in Pew Research Center surveys on which significantly more say they are at least somewhat confident in Trump than say they are not too or not at all confident (54% vs. 44%). 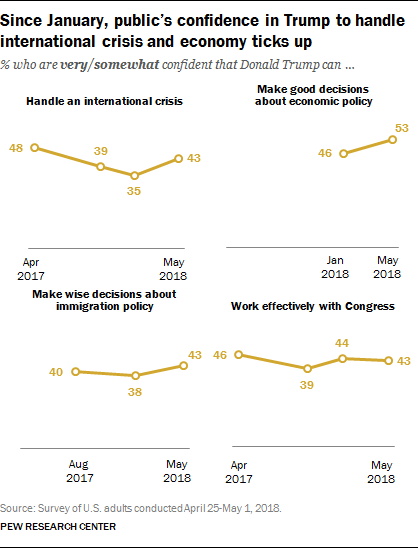 Views are similar about Trump’s ability to make good decisions about economic policy (53% express at least some confidence, 46% little or no confidence). Public opinion is split over whether Trump can use military force wisely (46% confident, 51% little or no confidence) and make good appointments to federal courts (46% vs 48%). On several other issues, such as immigration policy (55%), handling an international crisis (54%) and working effectively with Congress (54%), narrow majorities of the public say they have little or no confidence in Trump. As was true in previous months, there are deep partisan divisions on these measures, with no fewer than three-quarters of Republicans – and no more than a quarter of Democrats – expressing confidence in Trump in each of these domains. On many items, the share expressing confidence in Trump has remained steady over the past several months, but on others public confidence in Trump is now higher than earlier this year. Today, 43% express confidence in Trump to handle an international crisis, up from 35% in January; last April, 48% had at least some confidence in Trump’s ability to handle an international crisis. Since January, Republicans have grown significantly more confident in Trump to handle an international crisis (84% now, 73% then). Public confidence in Trump’s handling of economic policy also has ticked up since January (53% now, 46% then). In other arenas, such as immigration, working effectively with Congress and managing the executive branch, there has been little change over the past several months of Trump’s presidency. 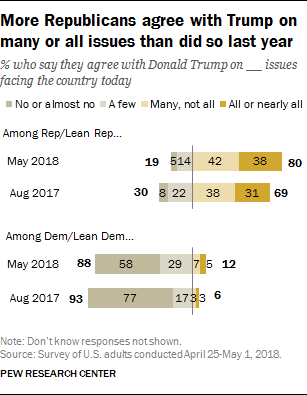 Eight-in-ten Republicans and Republican-leaners (80%) now say they agree with Trump on many or all issues, up 11 percentage points from last August. Nearly four-in-ten (38%) say they agree on “all or nearly all” policy areas, while 42% say they agree on many, but not all issues. Though an overwhelming majority of Democrats and Democratic leaners (88%) continue to say they have few or no areas of agreement with Trump, the share saying there are “no or almost no” areas of agreement has dropped from 77% in August to 58% today. Roughly four-in-ten Republicans and Republican leaners (38%) say they like the way Trump conducts himself as president, while 45% say they “have mixed feelings about” his conduct and 16% do not like it. Conservative Republicans are significantly more likely than their moderate or liberal counterparts to say they like Trump’s conduct (44% to 25%, respectively). And roughly a third of moderate or liberal Republicans say they do not like his conduct in office (32%). Democrats continue to overwhelmingly say they do not like the way Trump conducts himself (85%). Just 10% say they have mixed feelings and 5% say they like his behavior. These views are little changed since August. About four-in-ten Americans rate the ethical standards of Trump administration officials as excellent (9%) or good (30%), while 58% say they are not good (21%) or poor (36%). Current ratings for the Trump administration’s ethical standards are lower than for those at various points in other administrations dating back to when the question was first asked by ABC News and The Washington Post of Ronald Reagan’s administration in 1983. This question has often been asked when previous administrations have faced specific ethical controversies. 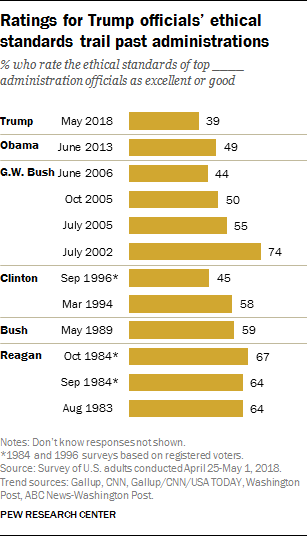 Today, three-quarters of Republicans (75%) rate the ethical standards of key administration members as good or excellent, while 86% of Democrats say they are not good or poor – including 61% who rate them as poor. Among Republicans and Republican leaners, these views diverge significantly by ideology. While just 15% of conservative Republicans express negative views of the ethical standards of Trump administration officials, about a third (36%) of moderate and liberal Republicans say they are not good or poor. Among Democrats, there are also modest differences along ideological lines, with 80% of conservative or moderate Democrats and 93% of liberal Democrats giving low marks for the ethical standards of the Trump administration. The overall balance of opinion among independents is far more negative than positive: Two-thirds (65%) say the administration’s ethical standards are “not good” or “poor,” while 31% say they are “excellent” or “good.” Among independents who lean toward the GOP, 67% say the administration’s ethical standards are excellent or good, while nearly nine-in-ten independents who lean toward the Democratic Party (88%) rate the standards as not good or poor. The public’s evaluation of the way Donald Trump is handling his job as president is little changed in recent months – and is roughly on par with ratings at the outset of his presidency. Today, 39% of adults approve of the way Trump is handling his job, while 54% disapprove. Roughly a quarter of Americans approve very strongly (27%), while 11% say they approve not so strongly. Evaluations are more intense among disapprovers; 42% of the public disapproves of the way Trump is handling his job very strongly, while 12% say they disapprove not so strongly. There is an 18 point gender gap in approval ratings of the president: 48% of men approve of Trump’s performance, while just 30% of women say the same. And there continue to be significant differences in views of Trump by race, age and education: Younger adults, those with higher levels of education and non-whites are more likely to disapprove of the job Trump is doing. Overall, half the public says the Republican Party has good policy ideas, while 42% say it does not; opinions about the Democratic Party are identical (50% say it has good ideas, 42% say it does not). Opinions about whether the GOP has good policy ideas are little changed from about a year ago, but the share saying the Democratic Party has good ideas has declined, from 58% last April to 50% today. About four-in-ten say each party has high ethical standards (42% say that about the Democratic Party, 41% about the GOP). These views are about the same as they were in April 2017. More continue to view the Republican Party as “too extreme” (48%) than say this about the Democratic Party (42%). While the GOP performs worse on this trait than the Democratic Party, the share of Americans who view the Republican Party as too extreme has declined since last June (from 54%); views of the Democratic Party are little changed (45% then, 42% now). Opinions about the traits of the two parties continue to be deeply divided along partisan lines. For example, overwhelming shares (more than 80%) of both Republicans and Republican-leaning independents and Democrats and Democratic leaners say their own party has good policy ideas, while less than a quarter say this describes the opposing party. Similarly, while only about two-in-ten Republicans or Democrats think their own party is “too extreme,” about three-quarters in each party think the other party can be described this way. However, partisans are somewhat less positive about their own party in views on whether it has high ethical standards, though majorities of Republicans (66%) and Democrats (64%) describe their party this way. Combining views of both political parties on ethics, a quarter of the public says “high ethical standards” describes neither the Republican Party nor the Democratic Party; 47% say it describes one party but not the other; and 17% say the description applies to both. 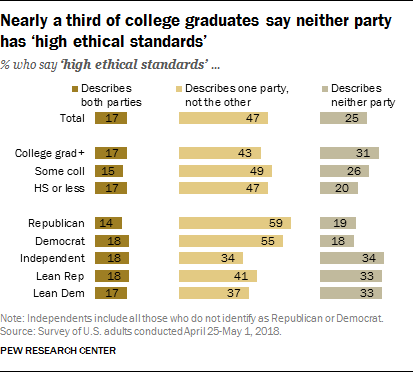 Among those with at least a college degree, 31% say “high ethical standards” does not describe the GOP or the Democratic Party; 43% say it describes one and not the other, and 17% think it describes both. By comparison, fewer of those with some college experience (26%) or a high school degree or less education (20%) think neither party has high ethical standards. And independents are significantly more likely than partisans to say neither party has “high ethical standards.” About a third of independents (34%), including equal shares of Republican leaners and Democratic leaners (33% each) say neither party has high ethical standards. By comparison, only about two-in-ten Republicans (19%) or Democrats (18%) say this. Nearly six months before the congressional midterm elections in November, just 19% of Americans say they are following news about the candidates and campaign in their state or district very closely, while 32% say they are following them fairly closely. About half of Americans (49%) say they are following election news not too closely or not at all closely. There are differences in attentiveness by race, education and ideology. Blacks are significantly more likely than either whites or Hispanics to say they have been following campaign news very closely (30% of blacks compared with 18% of whites and 13% of Hispanics). Only about a third of those younger than 30 (32%) are tracking news about the congressional elections even fairly closely, with just 6% following this news very closely. Nearly half of those ages 30 to 49 (47%) are following news about the midterms very or fairly closely, as are a majority of those 50 and older (61%). Identical shares of Republicans and Republican leaners and Democrats and Democratic leaners (52% each) say they have been following news about the upcoming elections very or fairly closely. And liberal Democrats (62%) are about as likely as conservative Republicans (60%) to say they have followed news about the elections at least fairly closely. Currently, 48% of registered voters say they would vote for the Democratic Party’s candidate for Congress in their district, compared with 43% who say they would vote for or lean toward the Republican Party’s candidate. A majority of adults under 30 (58%) favor the Democrat in their district. In contrast, those in older age groups are more divided. There are sizable educational differences in early midterm vote preferences: Those with a postgraduate degree favor the Democratic candidate over the Republican by roughly two-to-one (62% to 30%) and those with a four-year college degree favor the Democrat, 53% to 40%. Preferences are more divided among voters who do not have a college degree.